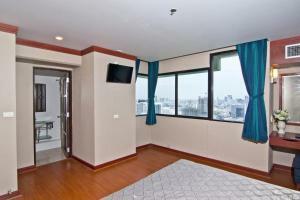 Featuring panoramic views of the city, Baiyoke Suite Hotel is 150 metres from Ratchaprarop Station. It has a restaurant, as well as an outdoor pool and a fitness centre. 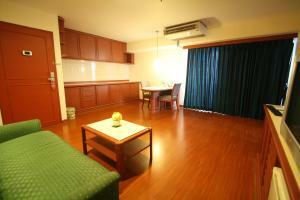 The hotel is 150 metres from Pratunam Wholesale Market and 1.5 km from MBK Shopping mall. Don Muang Airport is 20 km away. 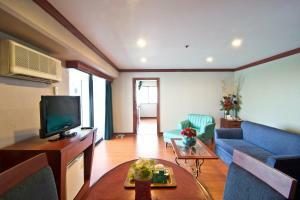 The spacious rooms at Suite Baiyoke are equipped with a minibar, refrigerator and safety deposit box. En suite bathrooms come with bathtub and hot shower facilities. Room service is provided. Recreational activities include enjoying a relaxing massage or lazing in the sauna. The hotel provides a business centre and a tour desk. Parking is free. Located on the 43rd floor, the Sky Lounge Restaurant offers a spread of food and beverages accompanied with views of the Bangkok skyline. Please note that the hotel offers a free shuttle service to Ratchaprarop Concourse (Suvarnabhumi Airport Rail Link). Guests are kindly requested to inform the hotel in advance if they wish to use this service. Contact details can be found on the booking confirmation. 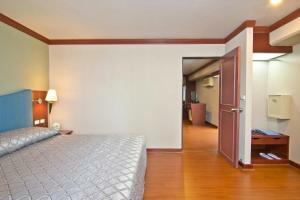 Room features 2 TV sets. Bathrobes and slippers provided. 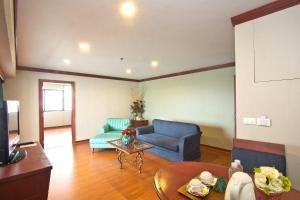 Rate: THB 1760.00 ... THB 2870.00; select dates below to get current rates.